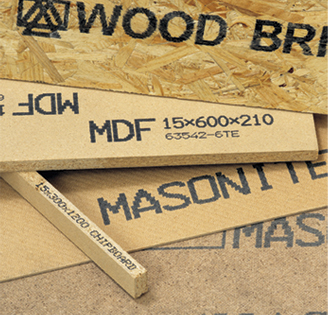 A large manufacturer of OSB panels and sheathing wanted to increase branding on their products by including their logo, product type, APA regulatory marking, and value-added marking such as nail lines. The company needed a supplier who could meet the harsh demands of an OSB plant while meeting the marking requirements of a variety of products. Lastly, their existing mechanical roll coder printing system was messy, and provided a low quality, nearly illegible mark, which did not position them as a quality, branded product compared to their competitors. Matthews designed a custom solution built around its highly reliable 16-valve and 32-valve 8000+ drop-on-demand printheads. These printheads are known for their success in printing high-resolution marks in harsh and dusty environments. Of the three nozzle sizes available, the Matthews 8000+ midi head configuration was selected, providing high definition boldness and mark quality. As part of this solution, the company also utilized Matthews’ universal print controller, MPERIA®. MPERIA® integrated with SAP and the company‘s WMS system, and provided a user-friendly interface for message creation and editing. As a full-service supplier, Matthews also offered the water-based and low VOC inks required to meet the company’s environmental responsibility guidelines. Ink supplied in 275 gallon totes made it convenient for the mill to manage. Matthews’ system proved to work reliably in this mill by lowering printhead maintenance, offering exceptional inks, and printing an extremely high quality mark. This company added value for customers by expanding its mark on products, and they plan to utilize Matthews in two additional mills.